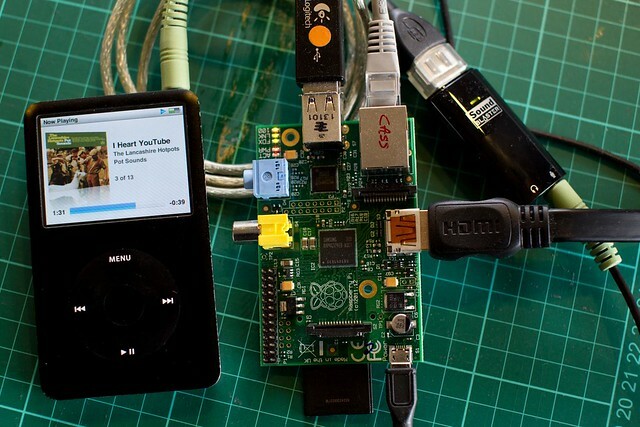 The Raspberry Pi does not have a microphone socket, which is inconvenient when you wish to record sound. To fix this you will need a USB Sound Card, for which I bought a Creative Sound Blaster Play! for about £20 and a short USB extension lead as the sound card is slightly too large and blocks the other USB port. With the latest Raspbian “wheezy” installed on a Pi Model B with 512Mb of RAM and the overclocking set to High in raspi-config, here is a recipe for getting your Raspberry Pi to record sound from the command line. For the test setup I connected my iPod to the microphone port of the sound card, plugged everything in and powered up. All of these programs have a –help option. $ alsamixerPress F6: Select Sound Card, and choose yours from the list, the bcm2835 ALSA is the on-board sound, for me the one to pick was: USB Device 0x41e:0x30d3 and take a note of the card number, in my case: 1. Now select the Mic and increase the volume to 52, or the first white blob, you’ll need to change it later, but its a good place to start. The Auto Gain Control wants to be off, select the gain control and press M to toggle so it displays [MM] for mute. Press Esc to exit and save the settings with:$ sudo alsactl store 1 where 1 is the card number. Congratulations, you now have a fully working Pi Recording Device. Remember to experiment with the volume levels, too high and your recording will sound distorted. I have one question. In your opinion, could someone record sound and something later (for example 60 seconds) playback the file. That is, could you introduce this type of delay to your IPOD. I am interested in designing one device that record what I listen from my radio and sincronize with a video streaming. I am new to the whole raspberry pi thing, but I am trying to record sound with one. Would I be able to connect a microphone into the sound card instead of the iPod and still record sound? (I want to record sound on a street). And then would I need to write additional code for that or could i just use the code you have created? Yes a microphone will work. You’ll want to set for different recording levels, the microphone output will be much quieter than the iPod. Just experiment to get the settings you want. Great article…I connected a Logictech C615 webcam and tested it according to your tutorial for microphone audio on webcam and it worked like a charm! I want to build/program a “Tape-Recorder”, a PI with USB Soundcard in a old TapeDeck Case. Your record sample with arecord works fine, but one thing i really need: a manuel stop or pause function of the record! It should record all the time until a gpio goes lo. Do you know how to make this possible? An interesting question, but at the moment I cannot give you an answer. I suppose some kind of keyboard emulator that works of the GPIO would work? I believe the Arduino Leonardo can be used as a USB keyboard, but that may be a bit bulky for what you want to do. it more how to stop a running recording manually? Looking at the man pages for arecord http://linux.die.net/man/1/arecord the –interactive option uses the space bar as a pause/resume, but more of interest to you: “When recording, SIGINT, SIGTERM and SIGABRT will close the output file and exit.” so a python script running as a deamon (background process) should be able to send one of those in response to a GPIO action (this is theory, and not tested). Thanks for a great article. At last something that works first time. that, karl, sounds nearly exactly for what i am looking for! Its late, but i will try something with that! Thanks for the information on command line recording. 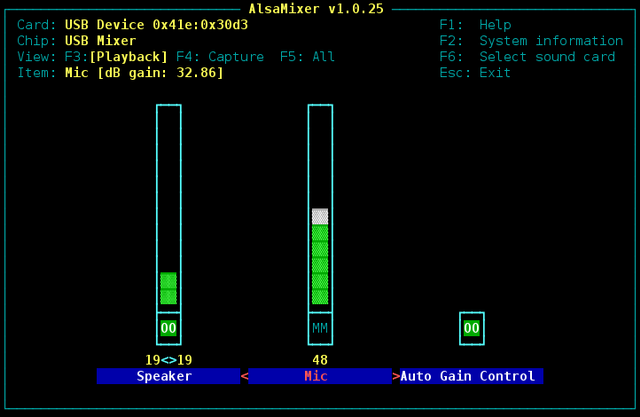 While not entirely relevant, you can check in alsamixer what your sound card will be by pressing F2(System information) and selecting /proc/asound/cards. The creative media sound card will be card 1 and it should tell you all the details. I had a bit of a stumble at first because I’m using a Behringer C-1U for my recording, and it registers as a different card. Generally you can use Audacity if you are using the X command window (via startx), but headless it’d be a good idea to use the command line interface. Another note is that it depends on how you record (or rather what recording device you use) that affects distortion. I haven’t really had problems cranking up my microphone to 100% and recording using that. Though again, your mileage may vary. This is a great guide, thanks for writing this down. Question: how long can you record for using this setup? I am thinking of trying to use this to record 33 rpm 12” LPs, ~22-25 minutes. I read elsewhere (http://scruss.com/blog/2012/11/20/raspberry-pi-as-a-usb-audio-capture-device/) that the maximum recording time is 900 seconds. Is this a hard ceiling or is there a way to record longer? I’m not aware of a limit on the length of recordings, as far as I can tell it’ll record until run out of hard disk space, although I’ve not tried this. Hi, I am using a Logitech USB Headset to record user commands as a part of another project.. I tested the above arecord and aplay commands and after adjusting levels, the record and playback are working great for the headset. Any clues how to resolve this? I have tried decreasing periodSize but still the same error. Thanks for an amazing write up. I followed your guide and was able to record the audio successfully. 1. The audio I recorded had a lot of noise in it. It varies with the proximity to the microphone. The closer I am to the microphone, the clearer the sound is. Is there any setting where I can reduce the background noise in the recording ? 2. The sound recording did not work when I used the inline microphone of my headphones together with the usb sound card. I was, however, able to record the audio with a stand alone microphone together with the sound card. Can you please explain why I was not able to record the audio with the inline microphone.